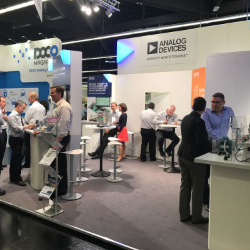 Analog Devices will be demonstrating the company’s technologies spanning the power-electronics domain, covering advanced motor drive inverter techniques, driving of the latest SiC and GaN power semiconductors, and precision management of battery-based energy-storage systems at PCIM 2018. Application engineers will be on the exhibition stand discussing these, and many other power-related topics from motion control and electric vehicles, to simulation of power-control algorithms. The company will also be featuring in the conference program, with experts from the ADI team presenting papers on motion control, monitoring HV power lines, and on working with wide band-gap power devices.